A new Edmond residence blends open, country, modern and transitional styles. The exterior of a new Edmond residence has an upscale, sophisticated design, which is “exactly what the homeowners wanted,” says Andrew French, owner of French Construction Co.
That’s definitely the first impression the homeowners wanted to make … but step across the threshold into the large entry and there’s a warm, comfortable, inviting aura. The entry sets the stage for the open design plan featured throughout the home. 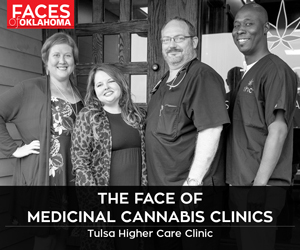 “From the entry, you can see all the way through the home to the back area,” says French, whose firm is also in Edmond. 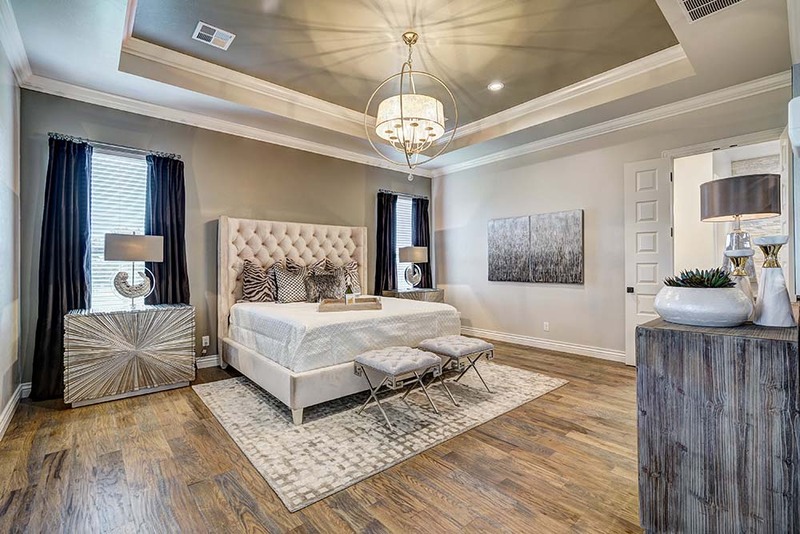 Tammy Trotter, interior designer with Silex Interiors, defines the home as a mix of modern, country and transitional designs. The airy atmosphere provides a comfortable flow from the entry/dining area into the neighboring great room and on to the spacious kitchen. Like many homes built today, the color palette is subdued. Pale grays and whites are accented by the natural shades of hand-scraped wood floors. Furnishings seldom shout; instead, they blend gracefully into this quiet, restful color scheme. The great room adds to the design flair. 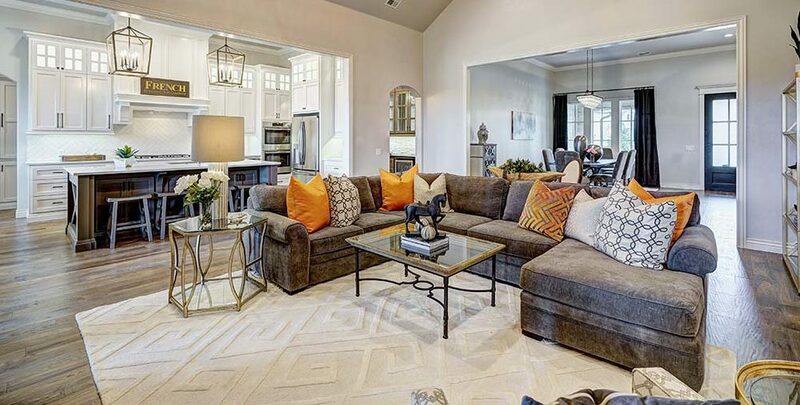 With a vaulted ceiling and an unusual chandelier, this area is a favorite gathering place for the family to host friends in a casual fashion. It’s “a great home for entertaining,” Trotter says. Interesting textures in beige and brown fabrics are accented with pillows and accessories in warm shades of blue and orange. 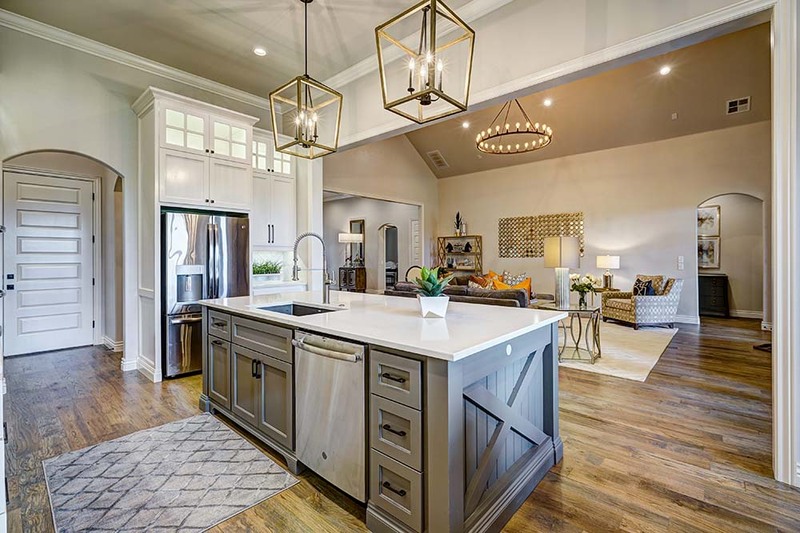 With the kitchen and a small dining area adjacent to the great room, and easy visual access to the main dining area, traffic flow is never an issue during parties. The country farmhouse aesthetic is particularly evident in the kitchen. A barn door theme accents the ends of the large center island, along with the Shaker-style cabinets. A steel-gray island, featuring a quartz counter top, is central to the functionality and pleasure of the kitchen, which is rounded out with a herringbone backsplash and dramatic pendant lights. A pleasant surprise behind the kitchen is a butler’s pantry, which the architect designed for easy, efficient service to all entertainment areas. 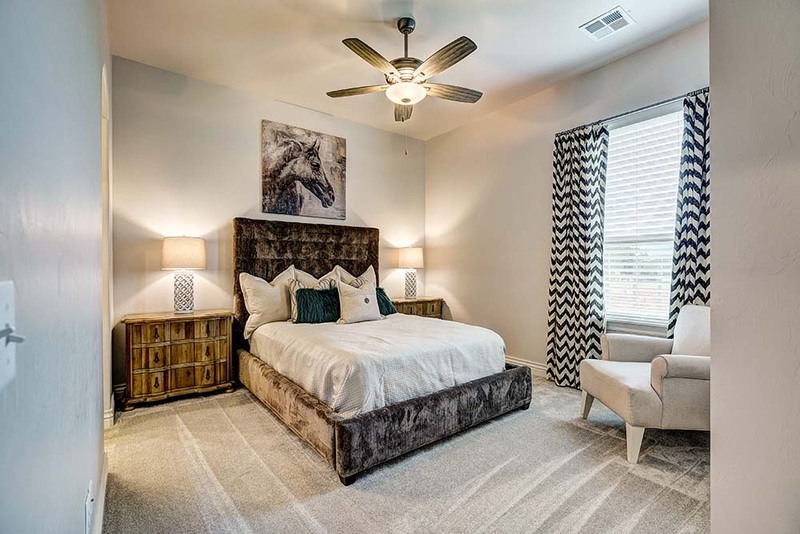 The master bedroom suite is an oasis of comfort and relaxation. The pale-gray color scheme continues here, but the focal point is the unusual recessed ceiling treatment in dark gray with an impressive chandelier. Furnishings feature what Trotter defines as “something old and something new.” A distressed hutch with mirrors adds to the design balance. 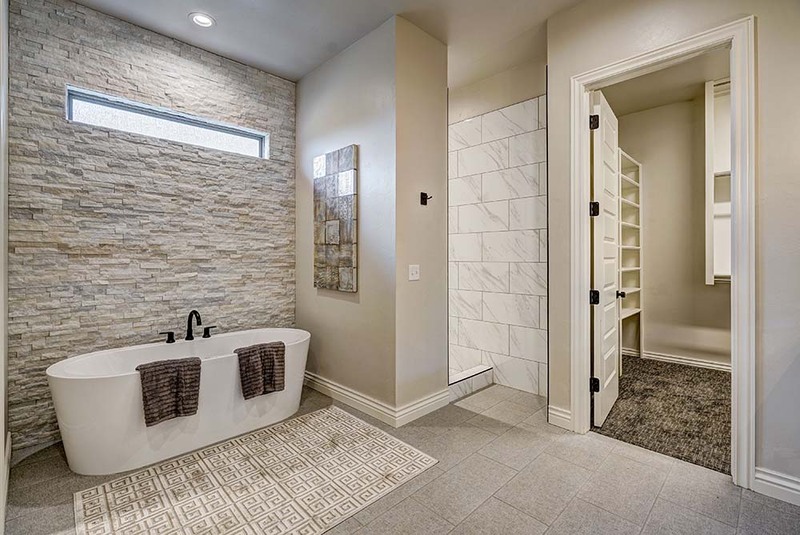 A his-and-hers design is apparent in the master bath. The showpiece is a free-standing tub, enhanced by a wall (designed by Trotter) of natural stacked stone in a pleasing mix of beige, gray and arctic white. The vanities are fashioned of marble. Overnight guests are treated royally in their private quarters. The connecting guest room and bath reflect the home’s hushed color theme. A spacious media room is also a favorite place for guests. A small office is a quiet getaway for handling business and social correspondence. 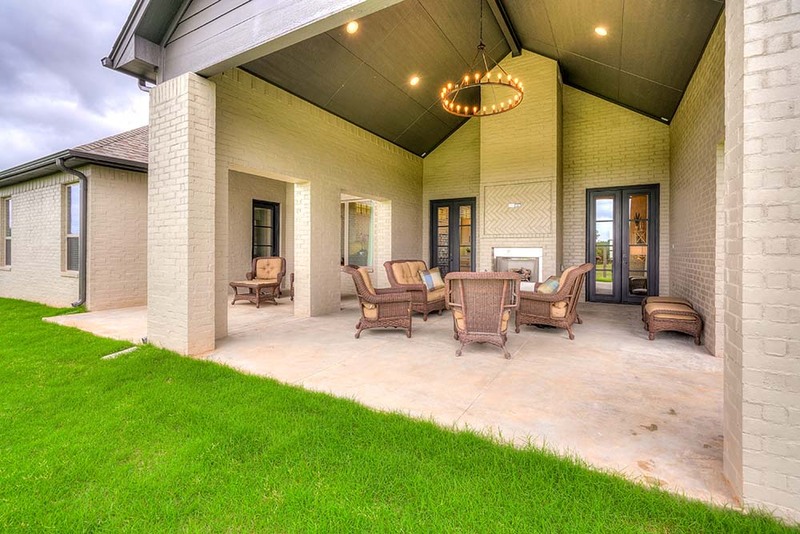 For total relaxation, the back patio offers a grand view of a greenbelt walking trail that winds its way through this exclusive residential area. It’s a perfect place for this family to begin and end the day.